A large Studio apartment in a stylish 1930’s portered mansion block, with a separate kitchen and bathroom with bathtub/shower. Sleeps 1-3. The bathroom has a separate dressing area with sink to allow more room for our guests. 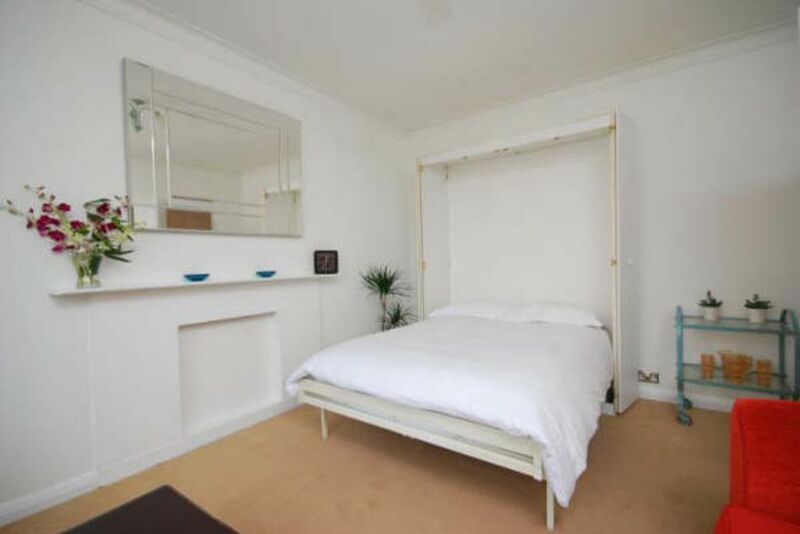 Located in Bloomsbury, Central London, close to Kings Cross and Russell Square underground stations. It's just a 10 minute walk to the Eurostar terminal and Euston station.It's a five minute walk from Russell Sq tube station. The studio allows easy access to the West End shows, Soho nightlife, Oxford Street shopping, and the bar/restaurants in Holborn and Russell Square are also within easy reach. Visit the British Library at Kings Cross and the British Museum in Holborn. Also close by is the Arthouse Renoir Cinema...showing the best in recently released independent films and classics. The Charles Dickens Museum is short stroll away. With large leaded windows overlooking a park and gardens, the studio has an abundance of natural light. Facilities include a pull down double Murphy bed (very easy to use) an additional sofa-chair bed (very comfortable)and a full height single air bed.There's wireless internet(very fast connection), cable TV, DVD, music system, and a fully equipped kitchen. All towels and linen provided. A perfect flat for a retreat visit to London or for those wishing to explore London.There is a lovely independent coffee shop across the road where one can relax and read a paper and take in life in Bloomsbury. A stroll down nearby Lambs Conduit St almost feels as though you're going back in time. Nip in for a quick pint at the Lamb Pub (one of the few pubs in London to have 'Snob Screens', linger in the independent shops along this charming street and pop in for a glass of wine at Vats Wine Bar .This area still has several independent books shops ,all of which are within a five minute walk. Your stay here wouldn't be complete without a stroll down Woburn Walk ,a stunning Georgian period Street with attractive bow fronted shopfronts and also once the home of poet WB Yeats. A selection of reference books about the local area and London are available for use during your stay.Please feel free to take them out and about with you! For guests wishing to cook at home we have pots and pans and plenty of dishes.The flat is minutes away from the Waitrose supermarket which has very high quality food products.There's also a handy 24 hour shop just opposite the building which is ideal if you need something very early in the morning or late at night. Bloomsbury has some excellent curry houses...one of which is just around the block...a must visit! For those traveling with children a trip to nearby Corum's Field will be sure to delight them.There are plenty of farm animals and there are often family activities throughout the summer holidays.Another attraction of the area are the secret public gardens of Bloomsbury. I seem to locate one on each visit. St George's Gardens on the corner of Handel St is wonderful.This is an ideal place for a picnic as it never seems to be too crowded and the when the sun is out it really is lovely.This is 4 minutes from the flat. There are numerous Art Galleries in the area and the Horse Hospital just behind Russell Sq tube station is well worth a visit.It's locate on a cobbled mews street and used to be a hospital for horses....they kept the name and it's now a very good modern art gallery and event place. They have some great book launches here. This holiday home will provide all you need for a lovely break in London. PLEASE NOTE-WE DO OUR BEST TO KEEP OUR CALENDAR UP TO DATE.WE ALSO HAVE OTHER FLATS THAT COULD BE AVAILABLE.PLEASE CONTACT US FOR MORE DETAILS. You are renting this flat from the owner, Charlene Coleman. James Koumis is the property manager. We really fell for Bloomsbury.You can really feel the history here.The area is safe and it's so close to Eurostar...that we know that Paris is only a few hours away by train! The lovely porter is very helpful. Large bathroom with overhead shower and tub.Large dressing area with vanity unit and sink.Hairdryer provided. Plenty of dishes and utensils for those who wish to dine in. small separate kitchen that allows our guests to cook meals. selection of local history books,London guides are provided.Feel free to take them out on walks with you! The building is very safe and secure. There's an on site porter. This Efficiency Flat is perfect for a solo traveler like me. It is roomy and comfortable with just about every convenience needed for a comfortable stay. Management of the flat is outstanding and responsive. The building is secure and very convenient. I recommend this owner and this property. I like the convenience of a refrigerator, kettle, two burners and a new modern microwave that has a non-microwave cooking setting, as well. Some might miss an actual oven, but I did not find it a problem. Plenty of dishes, glasses, tableware, Sufficient linens are provided and the washer dryer is a dream. Plus, there is a clean well maintained neighborhood launderette. Speaking of neighborhood shopping, this neighborhood has everything one needs! Thank you for such very kind words about your recent stay at Clare Court. I too really love the flat, the building and its wonderful Central London location.Bloomsbury really does have a wonderful feeling to it.It's safe and it's one of London's most historical areas.One has to imagine when the building was built in the 1930's, London was very different in terms of living space....especially true for the kitchen area.This building was designed with a view that most of its well heeled residents would be out and about at the Theatre. It actually had a dumb waiter to each flat....with almost a restaurant like kitchen in the basement.How wonderful that must have been. It's now one of the ,most loved purpose built buildings in Bloomsbury with a real sense of character and history. I hope to welcome you back on your next visit to London.Thank you for booking with us again. Great location, great place. Needed a bit more cleaning. Great location, great place! Needed to be vacuumed and the hide a bed sheet was not clean, however there was a vacuum we could use as well as a washer with some spare sheets so all was good. Charlene and James were helpful and accommodating. I would stay there again. Thank you- I'm so pleased to hear you enjoyed your time in Bloomsbury. I'll remind the cleaning company to really give the carpets a good hoovering each time. I hope you'll stay again on your next visit to London. We enjoyed our stay in Bloomsbury. Great, safe neighborhood with many food options nearby. Centrally located to the Tube and other train stations. Great building, comfortable unit, and cozy space. Agreed with previous reviews that a carpet cleaning and toilet seat would go a long way. So would a new shower head. Overall, great value for a flat in central London. We would definitely consider staying here again in the future. Thank you- I'm pleased you enjoyed Bloomsbury and the flat.The carpet has finally had its deep cleaning that it so needed. It almost looks brand new! The shower head has been soaked so the build up of limescale is no moreThe toilet seat has also been replaces with a more durable one..We do try our best to keep the place in a good state but we had to wait for a gap to have the carpets done.We hope to welcome you back on your next visit to London and thank you so much for leaving the place in a great state when you left.We're also pleased you found the flat to be good value for money for such a Central London location. I spent a week in the cute little studio. It's very close to St Pancras and other public transportation options. Walking distance to many museums and squares. And a lot of cafes and food options which unfortunately I didn't have time to explore to the full extent. James was great. Very responsive. Loved having a washing machine available. The tub is also a nice size if you like to soak your weary cold bones after a day in a chilly London. For one person the size of the flat is just fine. For 3 (my husband and daughter were with me for the first 4 nights) it's tight! A few little things that could be improved upon of course. Carpet could use a good cleaning. The beds would benefit from a nice cushy mattress cover so you don't feel the springs. But most nights I was too exhausted to notice. And a toilet seat cover (given that it's right next to the tub) would be a simple improvement. That said, I would still stay here again as you can't beat the location and again James was very accommodating. Thanks! Thank you- I'm pleased to hear that overall you really enjoyed your time in Bloomsbury.I hope to welcome you and your family back on your next visit the UK. Our apartment was in a perfect location in Bloomsbury. Although small the place was clean and and had all the basic amenities. The folks there were very responsive and helpful. They were also kind and responsive to my many questions. I would stay there again. My only suggestion is to provide a way one could get in touch with the front desk. We had a friend meet us and there was no way we could check with the front desk to tell them he was coming. Overall a great experience. Thank you- I'm pleased to hear you really enjoyed the flat and its location. It's very useful have the porter on duty but they are really there for security and to accept the odd parcel,they tend not to act as a concierge service and for that reason they don't give out their numbers. It's always best for visitors just to buzz the flat directly and then be let in. The porter won't let people into the building unless they know them or it's the postman,which is excellent as the security is great and makes people feel safe.I hope to welcome you back to Bloomsbury on your next visit. 48 Clare Court was an ideal place for me. It is a secure building in a great location. There are two Tube Stations close by and every kind of local amenity I could possibly want or need was nearby. The flat was clean when I arrived, a cleaner was available upon request. James, the owner's representative was always available and very responsive. This place is a gem. Thank you- I'm so pleased you really enjoyed Bloomsbury and the flat. Situated in the Heart of Historic Bloomsbury ,our flat has a wonderful quiet location. It's close to several historic attractions and is a short walk to the Eurostar Terminal with its direct trains to Lille,Paris and Brussels. The nearby shopping on Oxford St and Charing Cross Road will be a real treat for people who love to shop until they drop. From high end shops to the two very large budget Primarks,one will find something to take back home with them. After a morning strolling aroud the West End a special treat of a full English Afternnoon Tea will sure to become a special memory of your time in London. Yes, it can be somewhat expensive but it should be something that should be tried if you have the time and budget. The Ritz is by far the best in London.The Savoy, The Dorchester,Browns, and Clariddge's are all expensive but worth it.The National Portrait Gallery,The Wallace Collection and the Langham are more affordable and equally as good. Fortnum and Mason on nearby Picacadilly is also worth it. Their food hall is amazing/and even if you don't have time for the full Afternoon Tea you could buy some tea to take back with you. The tin cans ar simply stunning in design.A great gift for those back home.You will find that a few of the hotels near the British Museum also offer Afternoon Tea/but the ones listed above are far better.One exception is Bea's of Bloomsbury which is well worth a visit.